I have France on my mind. I miss my family, our home in France, and the quiet sunny summer days spent in our village. As it gets closer and closer to my departure I am craving all of the tastes of France. Rich cheese, local wine, country pate, figs picked off the tree and my dad's cooking. This weekend felt like a bit of a tribute to Europe and all of the tastes I'm anticipating. On Saturday morning we met freinds for brunch at Le Depanneur, a corner store meets cafe, meets event space, on the corner of College and Havelock. It has a full brunch menu on the weekend and we enjoyed the day's tasting platter along with poached eggs, a big bed of greens and the works. The service was slow, comfortable, and easy. Just like Europe. No rush. Good conversation. Good coffee. I am thinking of hosting a dinner here in the fall, so if you'd be interested (maybe a French feast?) let me know. After brunch I took off on a solo stroll through Kensington market and picked up just over 2lbs of mussels, some meat from my favourite butcher, a few specialty ingredients and a bottle of white wine on the way home. 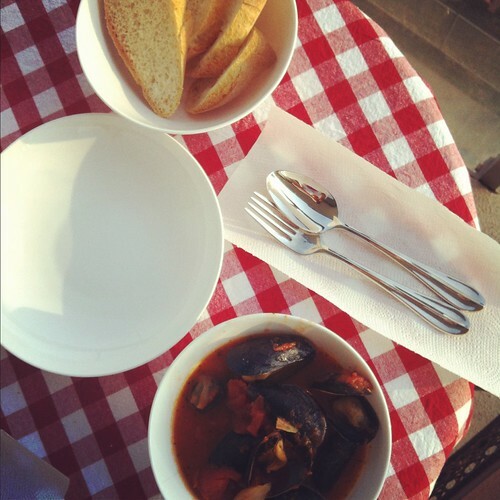 That evening I re-created a little French bistro on our balcony with big steaming bowls of mussels in white wine and tomato sauce (see recipe here). I made a giant batch, just as my mentor from our village taught me (Susan, more than three times my age, a stunning woman with long grey and white hair who knows every flower and every novel, moves like a young girl and cooks like a dream). 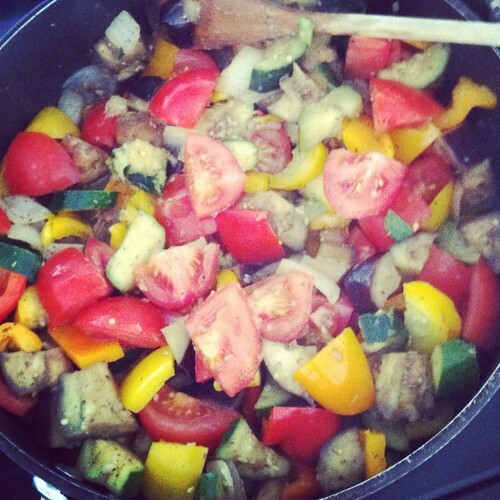 I love this dish because it's good hot, it's good cold, it can be incorporated into any meal and it tastes like home. After a few servings I felt a little more French, and even more ready to fly home.